With all this travelling we’ve embarked upon lately, not all of it is strictly camping — like last week when we ended up in San Fran to see son/DIL and we were walking around the city — too much walking for a traditional purse (deffo not my Channies) nor a crossbody bag as we ended up at Lands End, and not rugged enough for my REI backpack, so I decided to go off on one of my totes obsesh mish to locate the PERFECT designer VEGAN small pursebackpack. More handbag companies need to design small pursepacks for their collections. In my opinion, it’s the next big TREND. Safety: I need it to have zippers for safety and security. There are lots of cute backpacks with flaps and drawstrings, but that’s not practical. It’s just asking for a criminal type to stick a thieving hand in and steal my wallet, phone, and camera. Size: It can’t be too big nor too small. I don’t want to carry the weight of the world on my back, just the essentials. Style: Classy, not childish (no Hello Kitty this time); able to look good with nice jeans or a maxi dress. Nasty Gal offers a variety of vegan handbag/backpack but not all of their other lines (like shoes) are vegan. 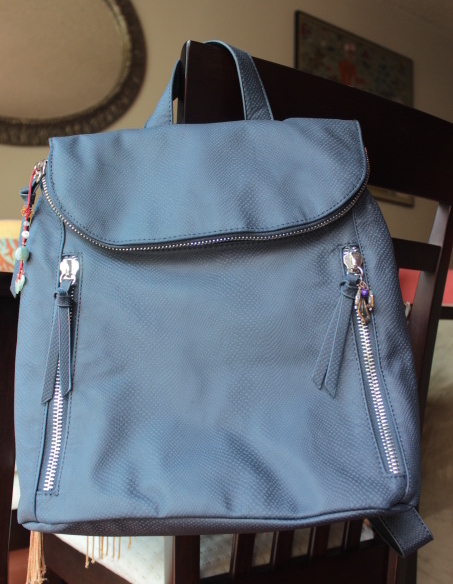 As I strolled the aisles at TJ Maxx after the gym, I discovered an adorably simple and functional backpack by a company I had never before heard of, Violet Ray, so I did a little research. Regularly priced at $88.00; on sale at TJ Maxx for $35.00. It’s crafted from a smooth faux suede snakeskin material and has two front zipper pockets for extra storage. Its unique front zipper opening gives it a sassy flare and has adjustable backpack straps. This entry was posted in All Posts and tagged Being vegan, Fashion, Fashionista, Matt&Nat, Shopaholic, Stella McCartney, style, Vegan backpack, Vegan fashion, Vegan handbags, Vegan leather, Vegan lifestyle by Enchanted Seashells by Princess Rosebud. Bookmark the permalink.